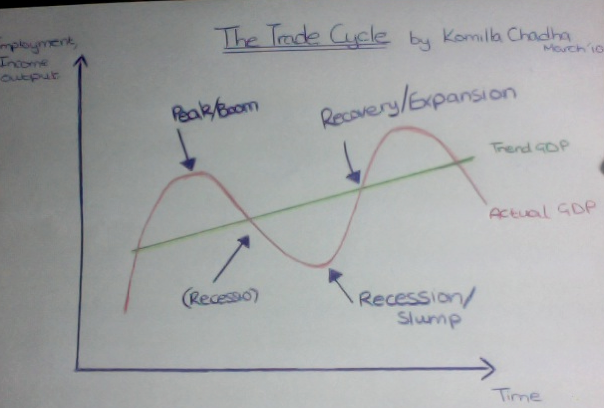 What is the trade cycle? The trade cycle is a graph depicting the recurrent swings in real GDP. Below I have drawn a simplistic version of one. What do these key terms mean? These are typically interchangeable but there is a subtle difference between the two. Peak is short-term period when the economy is doing well above its potential and is to some extent over heating as adverse impacts like inflation begin to kick in. Boom is generally used to describe a more prolonged and sustainable growth of the economy. GDP is at a sustainable 2%. But keep in mind peaks can last longer than booms. They both occur at the same place of the graph but the level of growth would usually split the two. It is when there is two consecutive quarters of negative growth in an economy. The recession why is can be used for the falling limb of the graph and the trough is because sometimes there may a few quarters of negative growth before reaching an all time low (slump as it is sometimes called) and picking up again. Or it could be positive but getting low on the limb before it reaches two quarters of negative growth on the trough. Thats why a recession can happen at either place. Slump and trough are other words used for the lowest points on graphs. This is the point where economic growth starts to pick up before reaching the highest point which may be in the form of a peak or a boom.